Palate-cleansing time, denizens. I needed something a little less dense to recuperate from the exhaustion of slogging through my last BookBin read. So while at our local library this past weekend (where I was ironically looking for The Girl Who Played With Fire), I strolled over to the graphic novel section. I noticed a couple of new titles since my last visit, including an oversized book with a bizarre name and a gorgeous and confusing cover. Plus, the font choices and placement screamed homage to 40s-era noir film posters, which also intrigued me, especially when combined with the anthropomorphic punim glaring at me through the ciggie smoke. Blacksad was a remarkable find, denizens, and one we can thank Dark Horse Comics for bringing to the U.S. market. It took a while for these comics to be translated from their original Spanish into English; in fact, the third offering in this collection had never appeared in translated form until this compendium. But I can assure you, it was worth the wait. Author Juan Diaz Canales and artist Juanjo Guarnido combined efforts to bring to the page a gloriously gritty send-up to classic noir tropes of a bygone era…with an animalistic twist. All of the characters, including P.I. 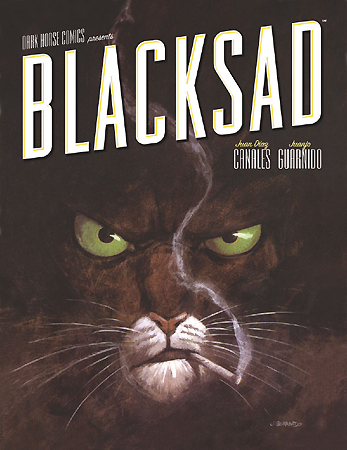 John Blacksad, are animals: cats, dogs, polar bears, deer, magpies, horses…all drawn in ways that are eerily human. At times the quality of expression and movement is disconcerting, but the overall effect is stunningly satisfying. In fact, I’d go so far as to say that it’s worth it to pick up a copy of Blacksad solely for Guarnido’s artwork, full of enough detail to ground it in the reality of its chosen time frame, but presented in these rich watercolor diasporas that give each tableau a hauntingly memorable quality. Final Verdict: High-quality hard-cover collection of fast-paced, well-written stories presented through some of the most gorgeous, gritty illustrations I’ve ever seen in comic book form? Definitely at the top of my wish list for ASAP addition to my library.